Vacuum technology from Schmalz enhances handling capabilities for any workpiece up to 2 000 kg! Our range of vacuum technology systems includes over 3 500 components, ensuring we can build tailored handling solutions to your application spec. Schmalz vacuum technology is distributed and supported across sub-Saharan Africa by Tectra Automation. Schmalz supplies over 3 500 vacuum components for its vacuum handling and gripping systems, allowing you to achieve your specific requirements! The Schmalz range of vacuum lifting apparatus increases your material handling productivity through precise, ergonomic and non-marking handling solutions. 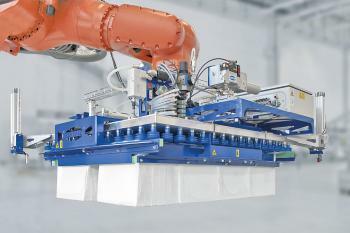 Schmalz vacuum gripping systems boost productivity in automated handling processes. Includes layer and vacuum area gripping systems and suction spiders. Use the Tube Lifters Jumbo vacuum technology for ergonomic lifting of sheets, boxes, bags, barrels, buckets, panels and jigs and load/unload CNC machining centres up to 300 kg. Crane and crane systems combine vacuum technology with articulated jibs, railed and column-mounted cranes and hoists to provide a handling solutions that can lift up to 950 kg. Can function as a stand-alone vacuum technology solution, or supplement the Jumbo and VacuMaster. We supply vacuum pumps in dry, oil-lubricated, water-ring and complete centre vacuum pumps, each with optimised suction rates from 2.3 to 255 m³/h, as part of our vacuum technology range. Our range of vacuum technology includes stand-alone vacuum blowers for use in all clamping and handling applications. Our compressed air distributors enable central compressed air inlets and extensions at any time. We also supply compact, inline and multi-stage ejectors, which are compact and easy to install for vacuum technology air supply up to 2 370 l/min. Area Vacuum Gripping System SBX vacuum technology handles sawn and construction timber, laminated beams, sheet materials, steel profiles, and pallets with warped and rough surfaces. Area Vacuum Gripping Systems FXC and FMC vacuum technology is ideal for surfaces with gaps. Grip a variety of materials, including cardboard, glass, metal, wood and plastic. Vacuum Layer Gripper SPZ vacuum technology is used in warehouse and logistics applications. Handles intermediate layers, pallets, cardboard boxes, film packaging, products in trays, etc. Vacuum Suction Spider SSP vacuum technology can be equipped with 6 suction pads for lifting metal, stone, sheet materials, automobile parts, glass, ceramics, solar panels in addition to non-rigid pieces. monitoring products – incl. manometers, regulators, warning devices, etc. 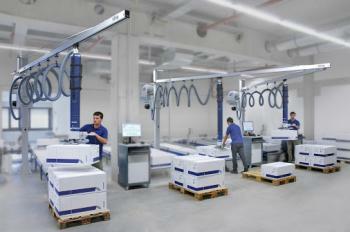 Maximise productivity of your material handling requirements! Refining over 30 years of vacuum technology R&D, Schmalz delivers a range of handling systems, gripping systems, generators and components that allows operators to handle the expansive inventory of workpieces found in southern Africa’s diverse industries. Schmalz’s vacuum technology delivers precise, fast, frequent and safe gripping and handling, enhancing productivity and safety across southern Africa’s industries! Enhanced operator safety – a range of innovations is incorporated into Schmalz vacuum technology, including adjustable-length operator handles that ensure the operator remains at a safe distance from sharp-edged workpieces. Even in the event of a power failure, our vacuum technology holds firm, with non-return valves and large suction-pad areas preventing loads dropping. Range of vacuum technology has full standards compliance to DIN ISO 9001 (quality management) and DIN ISO 14001 (environmental management). Aftersales service and maintenance – a competent technical team assists customers with any vacuum technology equipment breakdowns and repairs. 12-month warranties available on any Schmalz vacuum technology product. Long service lifetimes that achieve fatigue-free lifting for the operator. Our vacuum technology is built to last! Increase your facilities’ handling capabilities with our vacuum technology!